No info given by anyone as to what has changed. Filers dont bother giving any info on their timetables at all and Devon County Council seem to have given up updating their site. 32 withdrawn and all the 70s going back through Stoke due to ongoing late running from Torpoint. Also, *everything* anticlockwise will be a 51, including the journeys that start at Holly Park. Any idea as to the changes to the 25? The current timings work well with, usually, enough time to start each circuit from Royal Parade on time. The biggest gripe from passengers is the lack of a stop in the Derry's Cross area since (1) the Royal Parade stop was moved from the bottom end to between House of Fraser and Debenhams, and (2) the Derry's Cross stop being abolished to make way for the new pick up points for coaches. Last week one journey was delayed by over 10 minutes when one passenger laid down on the floor of the bus in protest at the absence of a Derry's Cross stop! PeterR - morning reliability has been ropy lately, the 9:15 service is quite frequently late or absent (usually on Monday or Tuesday for some reason, they seem to sort it out as the week goes on!) Hopefully not just paring back the first trip, it's dead handy for when I'm feeling too lazy to walk to work! Yep - giving the journey time in classic "from my house" mode I'm afraid! The regulars grumble at Optares, but at the minute it's mainly them or MPDs - pleasingly, we had a whole week of 25 on the 25 recently! 309/310 Traveline shows a timetable for 22/10 to 4/11. Road closed Blackmoor Gate to Bratton Flemington with 2 services from Barnstaple to Lynton or Bratton Fleming at existing times (generally). The end of City bus In Saltash I believe. No more number 10 and now green flash Elburton to St Budeaux only. Stagecoach have seen them off here? Also from post are we to assume there are a lot more city bus changes still to come? I have not heard anything about them taking the 5 out of Saltash. The start and end point of the route was down on VOSA as St Budeaux previous to these changes. And talking of Saltash, the 11 that leaves Plymouth at 1315 (1310 in the new timetable) becomes an X11, running non-stop St Budeaux to Notter Bridge. As does one mid-morning arrival in Plymouth. What is the new 61A? can you upload where there actually going instead of from city centre to plymouth on the 61 61A 62 It just says to honicknowle it dont say the difference between them all! At this stage we dont know what the new 61A is. This posting is from VOSA registrations where only very basic start and end points are recorded along with route numbers. 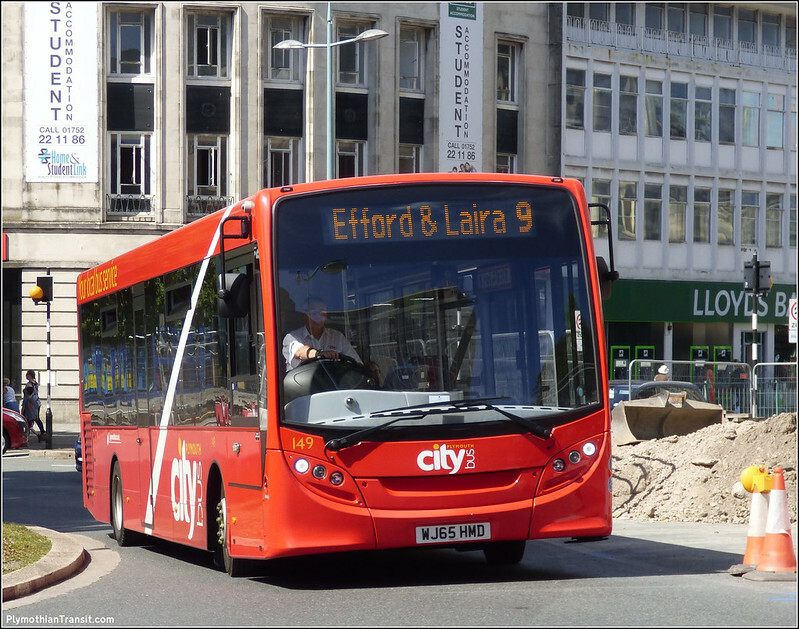 At a later date official info gets published by Citybus which I then add into the mix to get the full picture. Until Citybus tell us we are all guessing! That said, Citybus are usually very good at giving plenty of notice of any changes on their web site. Okay, I'm guessing the return of 61A Holly Park via Honicknowle as the new 51 is the previous 51. then 50/50a is estover both directions also do you know if the 51 is being yellow buses? as far as I am aware the 51 is part of Yellow Flash. It seems very odd that the National Express service to London is being registered as a local bus service - has it got stops close enough together for it to be used as such? Does thais mean that concessionary passes will be valid on to, at least for short journeys? Is the Falcon a new registration or is this just an amended timetable on an existing registration? Registration would allow journeys of less than 15 miles to be made, and also for the service to be eligible for Bus Service Operators Grant (worth over £4m a year on National Express coaching operations). PCB timetables are on Travelline and to be honest I can't tell what the differences are... 61a for example..I can not see although the 'new timetable' for 61/62 is there..there is no mention of 61a? The 61A is probably just a VOSA admin thing. Each VOSA registration has its own service numbers on it and if the timetable gets changed they often don't change those numbers. So the 61A will continue to appear on the registration unless PCB cancel that particular registration and create a new one with a different (registration) number. So my guess would be that the 61A isn't coming back, it's just the 61 and 62 changing their timetable. The changes to the 27 and 28 group look to be that the Sunday daytime service improves from hourly (alternating between a 27B and a 28B) to half-hourly (alternating between a 27 and a 28). But the Sunday evening service that is currently every 2 hours (27B) is dropped. It has been suggested elsewhere that Falcon registration is to allow more local journeys (under 15 miles in length) e.g Bristol Airport to local stops in the city, Cullumpton to Exeter and in Plymouth I note an extra stop from December at Astor Fields, Cattedown. Falcon registration - I guess it will allow short journeys, such as Taunton to Cullompton for which there is no public transport apart from the Taunton college bus and occasional connections at Willand (both BOS 22). Does that mean that pensioner/disabled free passes will be accepted? Devon CC says the National Bus Pass is not valid on express services or services on which seats can be booked. You can book Falcon on Megabus and it's express, so the pass is never likely to become valid. The Pass is for local buses only and excluding tourist services etc. Those with concession passes get a discounted ticket on the falcon services. £5 return from Plymouth to Bristol I believe. Also they have registered the falcon as a service due to the reduction of the X38, 39 and Gold services that are happening in December / January time. With the Falcon to stop at Astor Fields, Marsh Mills, Lee Mill and South Brent.. I think we will see the cancellation of the X38 in 2017. There are only two stops added at Lee Mill and interestingly one between bristol airport and bristol. You're not far wrong with your predicition. It's happening sooner than that I'm lead to believe. The Gold, X38 and 39 is have major service cuts. Its strange they taking on more drivers yet cutting these routes. Wonder what they will do with the Gold/X38 resource? Makes sense X38 is struggling I think ad falcon doing really well on same route. 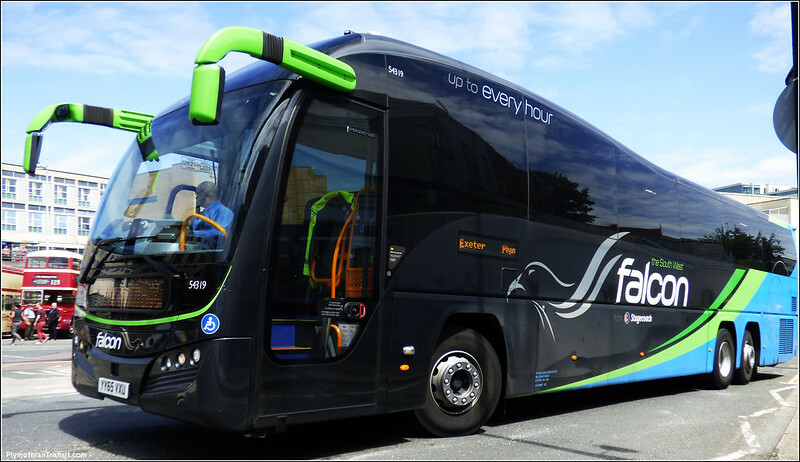 they can further enhance Falcon by picking up local journeys Lee Mill to Plymouth for example. Direct service £3.30 return instead of catching Citybus service and having to go through Plympton..getting stuck in traffic and also going via Laira etc. Much quicker journey on a lovely comfy coach and cheaper as well. Gold I suspect will go back to hourly now X80 out of the way! Can someone send me link to new 61/62 timetable on travelline or the website it self. It looks like there are some fairly drastic frequency cuts in Torbay. The 32 looks to be withdrawn between Torquay Harbour and St Marychurch, leaving this stretch - which not so long ago could boast up to seven buses an hour - to the 22 running every 20 minutes. There are some extra evening 22 journeys over this stretch, which don't link up with the evening 22 journeys between Paignton and Roselands! Conversely, the 32 receives a boost between Torquay Harbour, Chelston and Shiphay with buses running up to every ten minutes; every other bus continues to Torbay Hospital and The Willows maintaining the present 20-minute frequency on this section. I understand that the 32 is also to be single-decked, with these changes removing the 04-registered Tridents from Torbay. It occurs to me that this could easily combine at The Willows with the 34 to create a circular route. The X46 (to be the 46) is also in line for a drastic cut. It is reduced to just four return journeys on Mondays-Saturdays, so it appears it will be operated with just one bus. The first journey starts back at paignton and the last journey continues there. The late-evening Friday and Saturday journeys, only introduced in May, are gone - I suspect a complete lack of publicity is to blame, as you wouldn't know they existed unless you happened to come across them in the timetable. Most changes are normal winter changes including the X46 and in winter you wouldn't expect late night buses to continue. In Reply to Julian, the Optare solos for the 32 are being sourced from the Reserve Fleet in Exeter, Not sure if Eventually the 31/34 Torquay Local Routes will also be Reduced to Solo's,the 05 Tridents I presume will go into Reserve in Exeter or Plymouth allowing the Cascades of More 04 plate Tridents to Migrate to Stagecoach South, would imagine a Couple of Gold Buses would go To Exeter/ Plymouth to Operate the X38, the 13 Service also Loses 2 Solos as the Route is Shortened and the 13B is withdrawn. Torbay Should be the Silk Purse of Torbay unfortunately due to Total lack of Understanding and Poor and I'll equipped Management at all levels it's often been regarded as the Sows' ear,The 32 Service will be Operated by 7/8 Optare solos Replacing the 05 plate Tridents will go into Reserve Replacing the 04 Tridents Launched in 2004 on Paignton Sea front which Are going to Stagecoach South Shortly,The Slow Decline of the X46 Started back in 2006-2007 with the Tri Axle Hong Kong Olympians which continually failed and the Launch of the Platinum Ticket 🎫Exclusive to the X46-X38 which was overpriced and Put a lot of Season ticket holders back to Car Sharing and on the Riviera Train Line,in. recent times it's had the Timetable messed about so many times, it's Doesn't make a lot of Money well it doesn't take Einstein to work out The majority of the Ticket holders pay for a Weekly or 4 Weekly Ticket and most of the Revenue is taken Monday and Tuesday. Your right about the Marketing side it's very poor considering the Network Stagecoach South West have , back in the 1980s and 1990s Devon General and Bayline and Stagecoach had an Exceptionally Good Manager and Marketing Man Mike Palmer who Year after year continually Improved the Torbay Network year on Year he also had the Vision to introduce the Well Known Round Robin Day out Bus,Boat,Steam train which he built on when Managing River Link, he Remains involved even Now, his South Devon Bus Guide was an Excellent publication for visitors to Torbay and South Hams, Stagecoach have never quite matched it.